Going rifle hunting for deer this fall? Throw these must-have items into the back of your truck before heading off to camp. 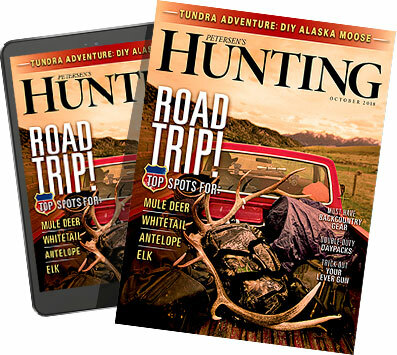 If you’re hoping to live out your whitetail dreams from a deer stand somewhere across our great country this fall, then consider securing some — or all — of these products from Academy Sports + Outdoors before you head off into the woods. A good rifle is one of the most important tools deer hunters can have at their disposal, and the bolt action Thompson Center Compass model is a good choice for a price that won’t kill the family budget. Maybe you’re a reloading fiend and ballistics geek like a good friend of mine is — someone who wants to tinker with each and every load that you feed into your hunting rifle. Or maybe you’re an easily confused guy like me who simply wants to know what works in the whitetail woods — a simple process where you grab a few bullets from the box, fill the magazine, crank one into the chamber and be ready to go when Mr. Big saunters by. Staying on the subject of rifle bullets — and big bucks — don’t overlook the timeless offering from one of the great American gun and ammunition makers in our land. 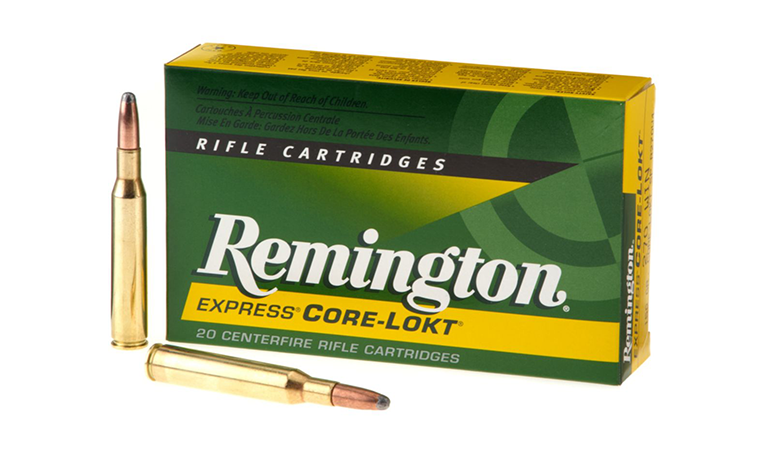 That’s a box of Remington Core-Lokt Centerfire Ammo, available in a number of popular deer-hunting calibers. Available in 20-round boxes in the familiar Remington green-and-gold Core-Lokt boxes, this deer hunting round features a progressively tapered copper jacket locked to a solid lead core, a soft-point bullet design able to deliver controlled expansion, high weight retention and superior penetration into a buck’s vital zone. Looking to find out what bucks are roaming your property this fall? Then you’ll probably want a good game camera to inventory the herd traversing your hunting property, as well as for building up a hit list of which big-antlered bruiser you want to wear your deer tag by the season’s end. Figuring all of that out — as well as keeping close tabs on any new bucks that might show up as the rut approaches — is a breeze when you’ve got the Wildgame Innovations Mirage TruBark 18.0 MP Infrared Digital Scouting Camera hanging from a tree or post. Able to silently grab razor-sharp 18 MP still images and up to 15 seconds worth of 720p HD video footage, this camera features exposure control settings along with a trigger speed of less than 0.5 seconds. 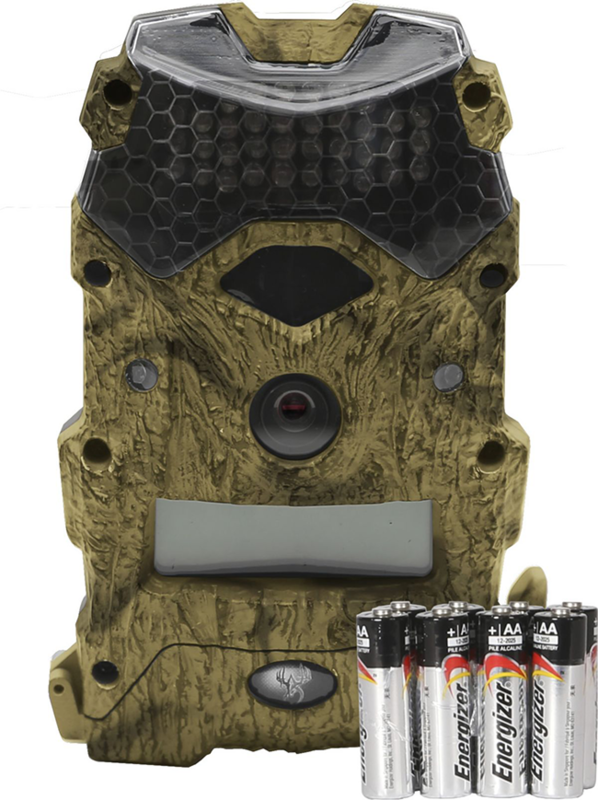 Running on eight AA batteries (included), this camera features TruBark camo concealment to hide it during the day. You’ll also get an 80-foot range, and 36-piece, high density LED infrared illumination capability to keep it working undetected at night. When I first started deer hunting, I carried only my rifle, a few extra bullets and a grunt tube call — all easy to fit into a small fanny pack in the most popular camo of the day. Today, I want to carry a bit more gear — not to mention some water and snacks — which usually requires a backpack of some sort. As noted in our Must-Have Bowhunting Gear article, it’s hard to beat the Magellan Outdoors Brush Backpack for such woodsy chores. 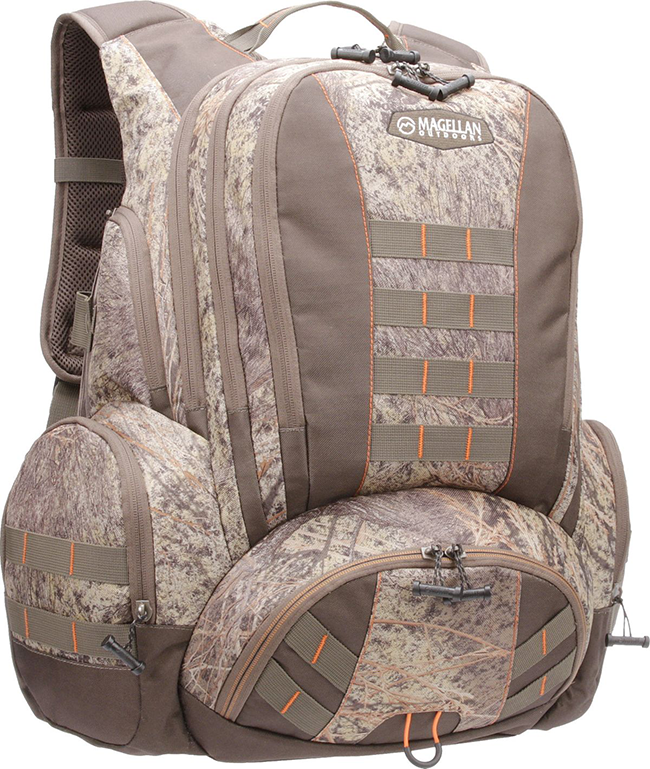 Able to give hunters a yawning-sized main compartment for the storage of rain gear, rattling antlers, an extra call, handwarmers, a box of bullets and of course some great snacks, this 25.6” H x 19.7” W x 7.1” D pack with its tough-as-nails Mossy Oak Brush camouflage exterior can help you get all of your vital gear into and out of the deer woods. In my early days of deer hunting, a kind gentleman that I knew from my Lone Star State roots invited me to hunt on his small East Texas farm. I’m glad he did — a morning sit in a tall ladder stand nestled up next to a big mature pine tree soon left me tagging the first whitetail buck of my hunting career. Tripod stands are a regular staple in the whitetail woods of Texas, a state full of deer but not many tall trees made for regular treestands. 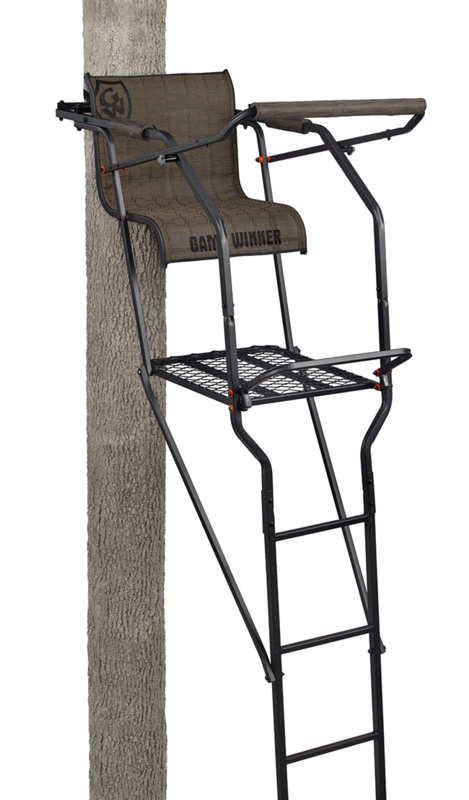 But the truth of the matter is there are plenty of other states where a stand like the Game Winner 2-Man Quad Pod Hunting Stand will work just fine. From a brushy area of new growth to the edge of a heavily used CRP field with only a few saplings sprouting up, there are plenty of places tailor-made for this quad pod featuring a rust-resistant powder coat finish. 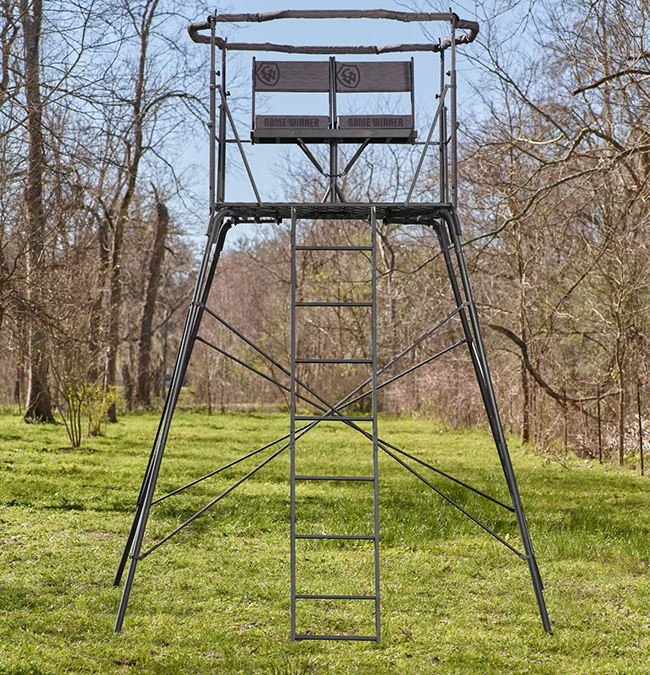 At nearly 10-feet tall, this two-man stand features a platform size of 57.5 x 57.5 inches and a seat size of 38.5 x 17.5 inches — more than enough for a comfortable hunt. While some states don’t allow the use of feeders in the fall, it’s a time-honored practice in several spots. While some hunters don’t appreciate it, living in a state where the thorny brush is almost impenetrable at times and visible whitetail movement can be limited, feeders help deer hunters see daylight movement, pattern a good buck and simply enjoy the afternoon’s local deer show even if the hunter has no desire to pull the trigger. 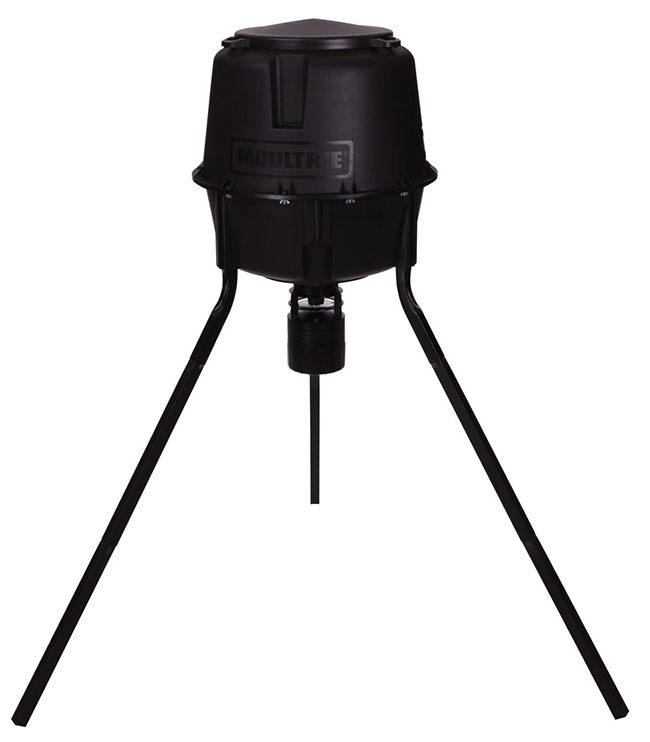 If corn and protein is something that your state allows for, consider using the Moultrie Deer Feeder Pro 30-Gallon Tripod Feeder. Able to be customized with run times of one to 20 seconds, this programmable digital timer can spin out corn or other suitable food sources up to six times per day. One of the most important questions about deer-hunting gear to a Texan each fall is the price of deer corn. 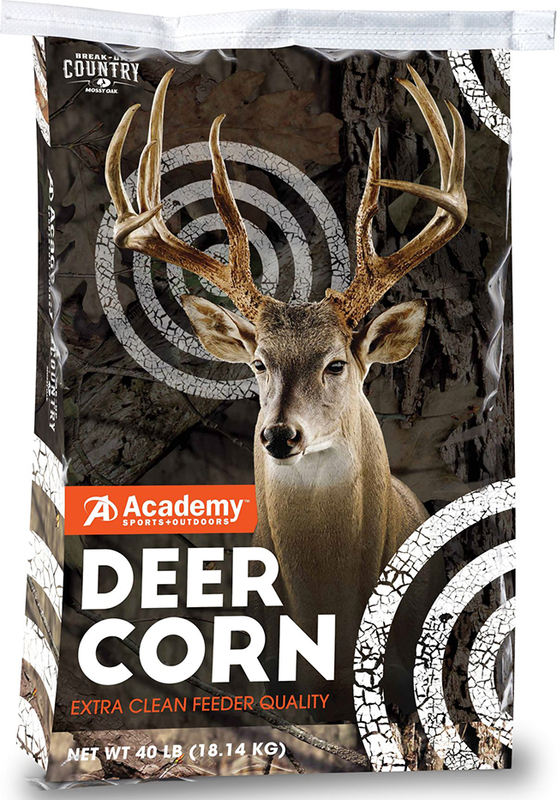 Fortunately, that price is never too much when you load up the truck with a few 40-pound bags from Academy Sports + Outdoors Deer Corn. Triple cleaned to reduce waste material in the bag, these golden nuggets can help provide deer with necessary energy during the rigors of the whitetail autumn, along with supplementing their natural forage when it is scarce on the landscape.